The Aba Knifefish is a huge fish with an aggressive nature, so is not for the average aquarist! The Aba Knife Fish Gymnarchus niloticus is unusual even for a knife type fish. It is one of the largest knife fish reaching up to 5 1/2 feet (167 cm) long (167 cm) and weighing 40 pounds (18.5 kg). Unlike most in this group, the fin that is used for locomotion is on its back instead of its belly. Other common names it is known by include Aba Aba Knifefish, Aba Khife, Aba, Freshwater Rat-tail, Frankfish, and generically as an African knifefish. The Aba has an electricity producing organ that runs through most of its body. Unlike the Electric Eel, this organ does not generate enough voltage to stun its prey so it is most likely used for navigation and finding food. But like the Electric Eel it is the only species in its genus, and it too uses its electrical field for a variety of things. It helps the Aba Knife identifying objects in the water, including food, and gives it spatial orientation. Males use an electric 'stereotyped' communication to court females. This fish can be considered dangerous because a big specimen could easily remove a careless person’s finger! If after all you've just been told, if you still think you are prepared to handle one of these fish, don’t buy the tiny ones that still show their yolk sack because they are very weak at this size. The minimum size to buy is about 3 inches and bigger than this is better. Aba Knife Fish eating some goldfish! Nice video showing a wonderful and healthy Aba Knife Fish stalking and hunting its favorite prey, some goldfish! This very exciting video really shows off how intense and beautiful these predatory fish are. The Aba Knife Fish Gymnarchus niloticus was described by Cuvier in 1829. There is only this one species in the Gymnarchus genus. They are found in in the Nile, Niger, Volta, Chad, Senegal and Gambia basins and Lake Rudolf in Africa. Other common names it is known by are Aba Aba Knifefish, Aba Khife, Aba, Freshwater Rat-tail, Frankfish, and African knifefish. They are normally found in slow moving streams and densely vegetated swamps and marshes. During the day they hide in holes or close to the roots of water plants. During the wet season they will migrate to the flooded forests to breed, constructing large, floating nests about 39 inches (1 m) in diameter. In its natural habitat this fish feeds on crustaceans, fish, insects, snails, frogs, and anything else that falls into the water. This species is listed on the IUCN Red List as Least Concern (LC). They have a wide distribution with no major widespread threats overall. The main threat to these giant fish is deforestation of its habitat, dams, and water pollution. Droughts also post possible threats. Regionally in In eastern Africa, it is categorized as Vulnerable (VU). The Aba Aba Knifefish is unusual even for a knife type fish. It has a flat long body, fuller and somewhat cylindrical towards the head but terminates in a thin point at the rear. Unlike most in this group, the fin that is used for locomotion is on its back instead of its belly. This fin can move in an undulating forward or backward motion. The color is dark bluish black on the back and sides, with a silver to cream underbelly. This fish has an electricity producing organ that runs through most of its body to the tip of the tail, generating a very weak electric field. This field helps with a variety of things such as identifying objects in the water, gives it spatial orientation, helps it to navigate, and helps it identify food. Males use an electric 'stereotyped' communication to court females. Size of fish - inches: 65.8 inches (167.01 cm) - These fish can get up to 5 1/2 feet long (167 cm) and 40 pounds (18.5 kg). Lifespan: 14 years - They will generally live between 4 - 14 years in the aquarium, but in the wild they can have a lifespan of up to 40 years. Aba Knife Fish are large dangerous fish and should only be cared for in commercial aquariums and by the most experienced fish keepers with the space and financial ability to care for these giants. The Aba Aba is actually not real hard to care for, as far as getting the water right and getting them to eat. They are very aggressive eaters and have been known to attack their owners. These fish grow very fast and not many homes can accommodate a 5 foot plus aggressive fish. You'll eventually need a lot of water to house a growing Aba Knifefish. Plan on eventually needing 300 gallons or more to keep one happy and healthy. They are sensitive to some fish medications such as copper and those containing formalin. Due to the size and aggression of this fish it is really best to leave them for commercial aquariums or hobbyists that have the knowledge, space, and money to properly and safely care for these giants. 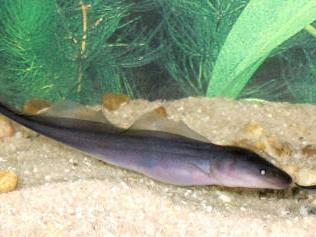 The Aba Knife Fish are carnivores, feeding on crustaceans, fish, insects, snails, and frogs in their native environment. Although they will eat insects, shrimp, and crayfish in captivity, the easiest food to feed them is live feeder fish. They can be trained to eat chunks of dead, freshwater fish which will help to keep the food expenses lower than if you exclusively feed live feeder fish. Some young Aba's have been known to take flake foods, but this is a rarity. The Aba is a big messy fish that ideally needs a sump-pump style filter. A high quality filter and 30 - 50% water changes are needed every week, depending on the bio load, to keep this fish very happy and healthy. Use extreme caution because these fish are known to attack and injure owners. Make sure to have a secure and tight lid to prevent injury to your Aba and yourself. The Aba Knife Fish will spend most of its time on or near the bottom of the tank. This is an extremely large and destructive fish in an aquarium. A 300 gallon tank is the minimum suggested size. Because these large fish produce a lot of waste a powerful an efficient filter is a must. A external sub-pump type filter is best because they can destroy just about any type of equipment in the tank, including filters and side hanging heaters. Place a strong submergible heater towards the bottom of the tank, there is a base placed heater in the subpump as well. Tank lighting should be very dim to keep this fish comfortable. They prefer dimly lit areas in the tank so it should be heavily planted and preferably with large twisted roots that offer shelter. If you plan on using driftwood and other decor make sure it is secure in the tank. The tank will require a tight and secure lid for the safety of the fish and human fingers from accidental injury. Minimum Tank Size: 300 gal (1,136 L) - A very large aquarium is required to keep adult Aba Knife Fish. Water Region: Bottom - The Aba Knifefish will spend most of its time on or near the bottom of the tank. This fish is best kept singly in a specimen tank. Small ones can sometimes be kept with other fish but eventually it will most likely try to kill and eat anything put in with them. They are extremely aggressive feeders. Peaceful fish (): Threat - The Aba Knife Fish is predatory and will eat smaller fish. The Aba Aba Knifefish has not yet been bred in captivity. In nature these fish venture into to flooded areas during the wet season and spawn in areas heavy in vegetation and rich in micro-organisms. They have distinct pairing. The male builds a large elliptical floating bubble nests in densely vegetated swamps that is about 39 inches (1 m) in diameter. The female Aba lays about 1000 'amber-like' eggs in the large nest. One of the parents guards the eggs for 5 days until they hatch but the adults exhibit no parental care after that. The fry will eat the micro-organisms until they are large enough to hunt for larger prey. Like most giant fish the biggest concern with the Aba Knife Fish is lack of space and food. If you can meet these needs not much goes wrong with these giants. These fish are hardy and disease is not usually a problem in a well maintained aquarium. That being said there is no guarantee that you won't have to deal with health problems or disease. Anything you add to your tank can bring disease to your tank. Not only other fish but plants, substrate, and decorations can harbor bacteria. Take great care and make sure to properly clean or quarantine anything that you add to an established tank so not to upset the balance. Because these fish eat live food, disease can be passed to them from their foods. Make sure to quarantine live food before feeding. A good thing about the Aba Knife is that due to their resilience, an outbreak of disease can often be limited to just one or a few fishes if you deal with it at an early stage. When keeping more sensitive types of fish, it is common for all fishes to be infected even before the first warning signs can be noticed. The best way to proactively prevent disease is to give your fish the proper environment and give them a well balanced diet. The closer to their natural habitat the less stress the fish will have, making them healthier and happy. A stressed fish is more likely to acquire disease. As with most fish the Aba Knife are prone to skin flukes, parasitic infestations (protozoa, worms, etc. ), ichthyobodo infection, parasitic infestations (protozoa, worms, etc. ), bacterial infections (general), and bacterial disease. These fish are sensitive to some fish medications such as copper and those containing formalin. It is recommended to read up on the common tank diseases. Knowing the signs and catching and treating them early makes a huge difference. For information about freshwater fish diseases and illnesses, see Aquarium Fish Diseases and Treatments. The Aba Knife Fish are commonly available. The minimum size to buy is about 3 inches and bigger than this is better. Don't buy the tiny ones that still show their yolk sack because they are very weak at this size. We sell flying,and eastern gray squirrels online, delivered to an airport near you or home deliveries with an extra charge. Contact us now, we have hand raised babies ready to go now they are all so friendly an sweet. These are very rare and hard to find, we only have a few babies left. We have adult breeders available also. LOOKING FOR ABA ABA if any one knows any store or person that has any size I'd be interested as they ship very easily because they breath fresh air, and are pretty hardy. Please provide a functional phone number and I will call to provide you the details on how to buy. aquascapeonline.com has them form time to time and alot of other cool fish. I work at a aquarium center, called Beltway Aquarium, located in Greenbelt,MD,we have one in stock as of 11/25/14.